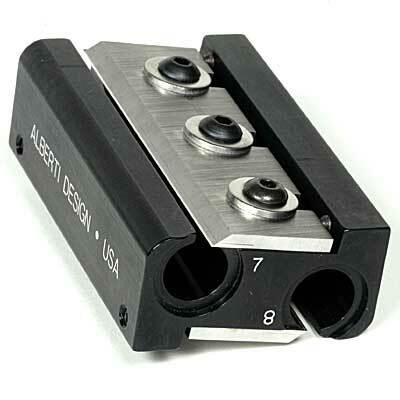 Our ultra-precision Peg Shapers are machined from 7075 high-strength aluminum and finished with a black anodized surface. They feature perfectly accurate bores, blade angles, carbide blades, and blade depth adjustment screws. Complete sets include six double-holed blocks to fit 1/8 through 4/4 size instruments (including large hole sizes for bushings). The blocks are also available individually for new instrument makers. Although our peg shapers are adjusted before they are shipped you may want to set the blades to cut more or less aggressively. The adjustment screws provided will allow removal and reinstallation of the blades with no change in blade position. When making subtle adjustments to the cut try turning the screws in no more than 1/8 of a turn at a time. The blade clamp screws should be kept fairly tight when moving the blade in. To move the blade out, back the adjusting screws out 1/4 turn, loosen the blade, slide it back against the adjusting screws (keeping about 1 mm of overhang on the large end of taper) and tighten the clamp screws. The shaper will now probably not cut. With a peg that fits the taper, tighten the adjusting screw at the large end until the blade just begins to cut. Cut the peg until it binds and tighten the small end adjusting screw until the peg starts to cut again or the large end stops cutting. Continue to cut peg until it binds again and, repeat this procedure until the peg cuts all the way through the shaper. Once you have adjusted a few blades it should take only a minute or two to get a perfect cut. The blades should not cut very aggressively and should produce a see-through shaving. On some wood you might try wiping a very tiny amount of soap on the peg shaft (or nose grease if you don’t mind the black streaks on your face) to reduce friction.